Top 10 Posts...as chosen by you! I was looking over the site stats and thought it would be cool to see what the top 10 posts at cliffdog/cliffharvey.com have been over the last few years. I was pretty happy with the results, as the most viewed posts are some of my favourites. Check out the articles below and feel free to post your comments and let me know what your favourite articles are! My interview with weightlifting and strength legend Steve Angell. Steve tells us of his physical and spiritual journey through the strength disciplines to become one of the strongest men to walk the planet. We discuss strength of body, mind and spirit in this great (and heavily reposted) article. My fight coach and friend; Professional MMA fighter Wilf Betz interviewed by Emily Beers of the Performance Advocate. 3. Barefoot Walker Accosted by Police! My barefoot antics nearly get me into trouble with the VPD! A run down on some of the epiphanies I have had whilst sitting on my board or duck diving white wash.
A surprisingly highly viewed short piece on the spiritual coaching aspect of my Naturopathic counselling practice. A discussion around Philo's seminal words; words that I consider to hold timeless wisdom. One of my favourite poems, and another that holds inspiration and wisdom, true and timeless. A poem that I wrote. Allusions of deception of both the self and others in the pursuit of comfort, solace and company. How my Mum showed me from a young age the beauty of universal love and how years later this allowed me to come to peace with God. 3 songs x 3 workout! Over the last two months I've traveled through Washington, Idaho, Utah, Wyoming, Nebraska, Missouri, Illinois, Michigan, Ohio, Indiana and Oklahoma with my boys in Like A Storm ; and ending up surfing in Tofino and chilling in Whistler with family (and about to embark on another jaunt around BC!) Suffice to say that we found it difficult to say the least to find a gym on the road! Between LOOOOONG drives, playing shows, getting back late to the hotel only to crash, and then up and in the van for another drive the next morning, there was little time for a structured gym workout. I've never really been too worried by being without a gym. I have several friends who would never even think about going away without access to a training facility but after travelling through over 20 countries for extended periods of the last 10 years I know that it's not always possible to find...and the pursuit of such can be a sure fire way to wreck an otherwise more interesting holiday. If nothing else being away from a gym provides a break from the same implements and patterns that you can fall into when training at home. It also forces one to 'display adaptability'. I remember reading a very cool article on 'displaying adaptability' in an old issue (one of the few 'hard copy' editions they printed) of T-mag many years ago. It had examples of people with less than optimal schedules, financial situations or physical attributes who still fronted up and trained hard and effectively in spite of their circumstances. On the road the fatigue of travelling and late nights dictated a significant reduction in intensity and volume but I (and Kent from the band) made an effort to still get in regular workouts of lunges, bodyweight squats/pistols, and a variety of chin ups (we take a chinup bar with us on the road) and pushups with the odd bout of yoga and stretching/mobility work. I do admit that after several weeks of only callisthenic work I really crave the feeling of heavy load and any hotel gym that actually happened to have weights (especially some heavy bells) or at the very least a universal machine provided some variety. Not always ideal but when situations are not ideal what are you going to do? When the choice is nothing versus 'displaying adaptability' and doing something I choose the latter. A great variation that I am really fond of for on the road training is timing supersets or circuits by songs and simply doing as many sets as you are able during the time limit set. It's that simple and while it may not be the most technical programme on the planet, when you've got to display adaptability...you do what must be done! Now don't get me wrong, I don't consider myself an expert in the waves, but off and on for the last 20 or so years I have spent a fair bit of time in the water, most of it on a long board; and I've been lucky enough to surf some great breaks and some beautiful locations in New Zealand, Australia, Brazil, Uruguay, Peru and now in North America. 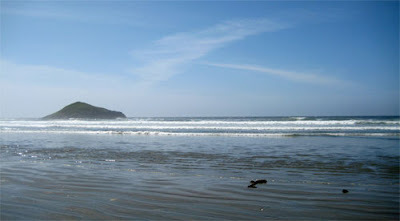 Surfing Long Beach, Tofino on Vancouver Island was something that I had been meaning to do since I arrived in Canada nearly 3 years ago! And, apart from the occasional jaunt home to New Zealand I haven't been in surf since I got here! Tofino itself is a really cool little place. It would be very easy to lament the growing numbers of tourists, the inflating prices and the loss of the original 'small town' vibe; but all you need do is look across the water to the ramshackle house boats, the beautiful inlets and forest laden coasts seemingly flowing into the water as the water flows to it's edge to be reminded of what a special place this part of the country is. It was a little different to be getting all wrapped up in booties and hood to go surfing....as some of you will know I most often like to surf in simply boardies, and look fondly back on some of my favourite days bare backed sitting on a long board out the back in Costa Azul and Floripa....But everywhere is different and getting into the cool waters of the Pacific North West on a nearly deserted beach on a cool and overcast morning was something special and something that felt (at least to this humble observer) archetypally Canadian. So often in the surf...and in life we 'follow the crowd' and go to where everyone else is. We expect that others know better than us and that by being where everyone else is we will be in the best place to pick up great waves (opportunities). But often the crowd started with just one person going to a particular spot on the beach, and another going to the same spot and then everyone else just figured it was the best place to be. Now it may be true that someone or a group have some inside or 'local knowledge' so of course it's valuable to take note of where people are and to watch how the waves are breaking and what's going on with the conditions, but there have been many, many times when I have taken the option of an isolated beach break over a crowded one and have been rewarded with my choice of great waves. 2. Catching a great wave is often better than waiting for the 'perfect' wave. Procrastination rules many lives....and often in the water (and of course in life!) we try to position ourselves to wait for, and do end up waiting for the perfect wave or the perfect opportunity, and in doing so let a lot of great waves pass us by. Perfection too is a self defeating ideal. NOTHING in life can ever be perfect. We can strive to do our absolute best, and so in a way it could be said that we are reaching for 'perfection' but we must also be aware that we won't reach it...because it's impossible and to be prepared to satisfice at a level of achievement that makes us extraordinarily happy. We often to define 'perfection' not in our own terms but in those of others. Catching our great 'wave' is a personal thing. Don't let those great waves pass you by! So often when I was younger I would paddle hard to get out the back and then I would see a great wave and turn immediately to catch it, even though I was too tired to paddle hard enough to catch it. You end up exhausting yourself further, and on occasion stuck in a lineup of breakers that take a fair amount of paddling, duck diving (and if you're on a really big long board abandoning ship!) and battling to get out from. Patience is a virtue...and one leant with age! Preserving ones energy, drive and verve, honouring, looking after and caring for oneself is something that we tend to not do as youth, and only begin when imperatives are thrown at us by the passing sands of time. I found myself for I think the first time, paddling out through a pretty heavy set (one of the only big sets of he day) and enjoying the grueling ardour of muscles paddling hard for the first time in a few years rather than simply wanting to be out the back waiting for a wave. But I realised that most often in the past I was wanting to be out the back, or on a wave and there were aspects of the 'journey' that I had a real aversion to. The interesting thing is that so much of what feels great about surfing is the great workout that your body gets, the connection that we develop with the water around us, the energy of the kinetic force of the waves - all things that are encapsulated not just on the catching of waves, but in the journey to get there. And out in the water I didn't think about this so much as just appreciate that every movement, every 'step' along the journey was a gift, a blessing and a joy in and of itself. In the surf as in life there is particular etiquette, and if a wave is not yours to take in some breaks around the world it bodes best for your wellbeing to pull off and let the other surfer have the wave! Doing so humbly and without malice is a great exercise in humility - like bowing at a temple. Simply saying 'sorry' and 'thankyou' in this and many other moments in life is a surrender that brings us closer to source and removes the attachment to ego outcomes that so often handcuffs us. However humbly taking your wave is equally important. If you are being dropped in on there is nothing wrong with holding your line and taking what is yours. It is not about possession or ego, simply standing up for yourself. I have seen many young surfers (and I have done this....) not taking waves because they are being crowded out by bullys in the water - even when it's clear that they were in the better position. We all want to stay and catch that 'last wave', just as in life we often want to eek out every ounce of ecstasy, profit, windfall or whatsoever else is driving us along in a given moment. But sometimes it is time to say 'enough's enough'. There have been countless occasions where I have been getting cold and tired in the water and have wanted to stay for one last wave...and on catching that last wave in have though 'Maybe just one more...' and gone back out again in spite of the fact that my faculties are declining. And so en homage to my last point I will go....my compadres who are more accomplished surfers than I, I'd love to hear your thoughts on these, and other analogies from the water to life! Feel free to comment.